A new particle accelerator is further enhancing the research landscape at Johannes Gutenberg University Mainz (JGU). It is to be employed to conduct research into potential applications of medical relevance. 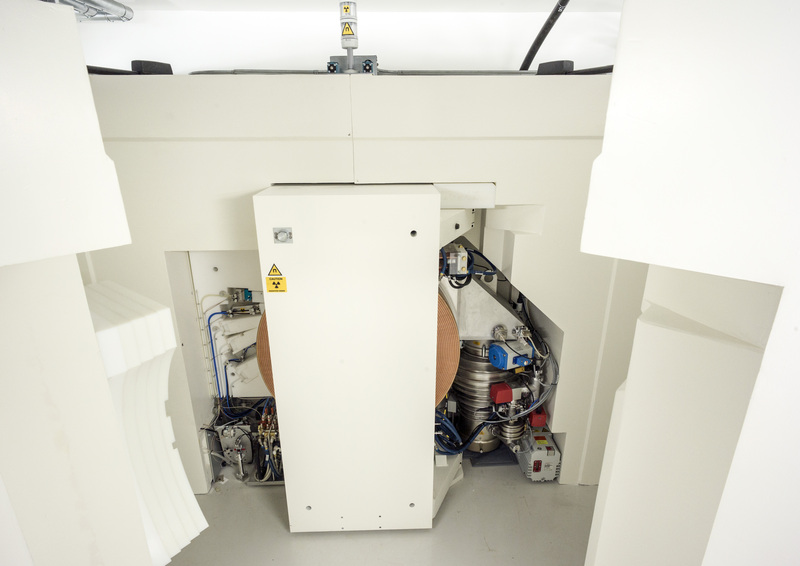 The cyclotron was installed in a basement building at the JGU Institute of Nuclear Chemistry in December 2015 and has now been officially put into operation. It will be used to generate isotopes with a short half-life, which are important for fundamental research but are also required for the medical imaging technique known as positron emission tomography (PET). The German Research Foundation (DFG) and the Rhineland-Palatinate Research Initiative funded this research facility worth some EUR 1 million. The JGU cyclotron is a ring-shaped particle accelerator that occupies an approximate floor space of 7.5 square meters and has a height of some two meters. The accelerator weighs about 50 tonnes and when it was installed in December 2015, a crane had to be used to lower it through a hole in the ceiling into the basement room. Mainz University constructed this new building complex at a cost of around EUR 1.2 million. It is accommodating the cyclotron and includes other facilities containing technical and control equipment plus an air lock. The structure is linked directly to the extension building of the Institute of Nuclear Chemistry and has all safety-relevant features. As it is able to accelerate protons to an energy of 9.6 mega electron volts (MeV), the cyclotron can be used to generate the two radioactive elements fluorine-18 and carbon-11. These will be mainly employed for chemical and pharmaceutical research purposes but are also required for the PET medical diagnostic imaging technique. F-18 and C-11 have short half-lives of just two hours and 20 minutes, respectively, which makes it necessary to generate them near the location at which they are to be used to ensure that they are available in sufficient quantities. The launch of the new cyclotron means is it now possible to produce C-11-labelled radiopharmaceuticals on site in Mainz. 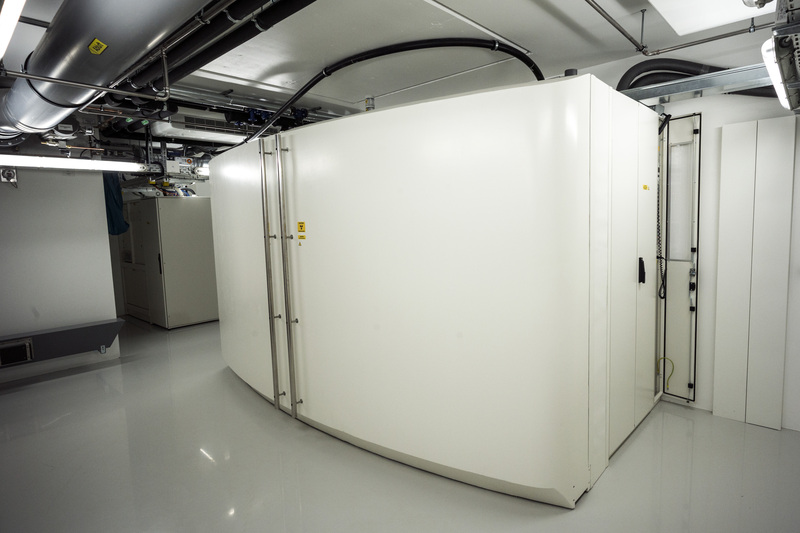 "The cyclotron supplements the research infrastructure already in place at Mainz University. Now that we can produce our own radioactive nuclides, we have additional opportunities for our research and development of alternative radiopharmaceuticals," explained Professor Frank Rösch of the JGU Institute of Nuclear Chemistry. "It will significantly facilitate the generation of new radiopharmaceuticals and their preclinical evaluation as well as—working in collaboration with the Department of Nuclear Medicine at the Mainz University Medical Center—potential applications in human medicine." Additional benefits are to be expected through interdisciplinary joint projects in which the disciplines of nuclear chemistry, pharmacy, organic chemistry, and nuclear medicine at JGU will collaborate with regard to the development and evaluation of new PET radiopharmaceuticals with external institutions, such as the Department of Psychiatry, Psychotherapy and Psychosomatics at RWTH Aachen University and Max Planck Institute for Polymer Research in Mainz.